It's dark, and the two toys, father and son (both pla-skool-type figures), are early risers, up and off on the job. As a human boy sleeps on under his covers, this crew of two leaps into their red jeep and careen out of their parking spot on a search-and-rescue mission. Headlights gleam and tires squeal as the two head out to pick up all the toy people scattered over the bed. Two rabbits are located and urged to hop in as the two roll on. WORKERS FINISHING WITH THEIR SHIFT. "BUDDY, CAN WE HAVE A LIFT?" The red jeep makes the rounds through the hills and valleys of the coverlet as their vehicle becomes more and more crowded. A hill looms ahead. Is the overloaded jeep up to the climb? NEARLY TOO MUCH WEIGHT TO PULL! At last the jeep creeps to the top of the rise, a windowsill which overlooks a sunrise just stealing over the back yard. As the passengers pile out to admire the sight, their boy awakens and joins them, smiling with the prospect of another day and more play. WHAT A DAY! HONK, HONK! BEEP, BEEP! Daniel Kirk, notable author of the Library Mouse series, brings his vivid colors and Toy-Story-type characters into his latest solo effort, Honk Honk! Beep Beep! (Hyperion, 2010) in this chipper toy adventure, good for the early preschool and emergent reader audience. 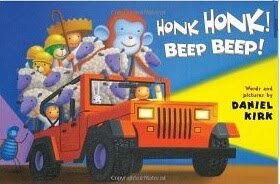 Easy text in rhythmic rhymes, with an irresistible sing-along refrain of "Honk, Honk! Beep, Beep! for the story circle make this one a good one to pair with any of the other popular vehicular tales, such as Kevin Lewis' My Truck is Stuck! (also illustrated by Daniel Kirk) or Jon Scieszka's Smash! Crash! (Jon Scieszka's Trucktown) for a rockin''n' rollin' read-up.